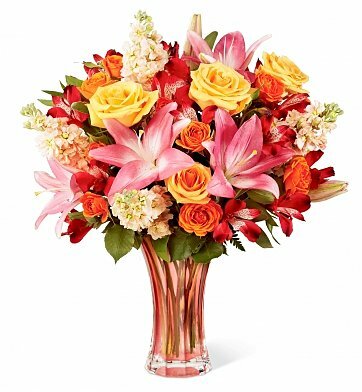 Gorgeous roses and asiatic lilies reflect the radiance of a spring sunrise in a tinted keepsake glass vase. Colorful and fragrant, it's the perfect bouquet for bringing a touch of spring indoors. Salmon Asiatic Lilies, Lush Greenery and more. Standard Arrangement Measures 9" x 16". Touch of Spring Bouquet is a hand delivered gift. These gifts are delivered by one of our local design centers located throughout the United States and Canada. Same day delivery is available for most gifts when ordered before the cutoff time. The cutoff time for Touch of Spring Bouquet is 2 PM in the recipient's time zone. Send a cheerful expression of spring's sweetness with this radiant bouquet of fresh lilies and roses. The flowers were even prettier in person than shown online. Mother -in-law said they were beautiful.